This is an advanced level project, not recommended for beginners. This hat is made without use of a form or base. It is created entirely with thin batiste hand shirred over wire frames. But the end result is wonderful!! 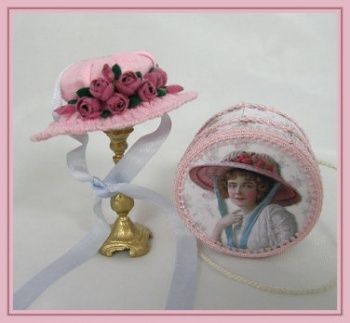 We have also included a lesson on making the beautiful velvet roses using velvet craft ribbon. Matching Hatbox is also included.